Breanna Biggham, center, and Brielle Collier, right, visited the RIT campus for practice interviews and a college tour March 12. The 11th graders from Joseph C. Wilson High School are participating in the Esquire Hour All-Star Mock Trial Challenge and are considering law careers. Here, they share their thoughts about the workshop series with Kraig Farrell, RIT GEAR UP director of student and academic affairs. High school juniors in the Rochester City School District are learning about careers in the law through a mock trial tournament sponsored by Rochester Institute of Technology and attorneys from the Rochester community. RIT GEAR UP (Gaining Early Awareness and Readiness for Undergraduate Programs) and private practice attorneys Craig Carson and Gregory Salmon are sponsoring the Esquire Hour All-Star Mock Trial Challenge for 25 students who are part of the RIT program. Through eight weeks of workshops and a culminating tournament, students will learn how trial attorneys build a case and argue it before a judge. Teams of students will take turns prosecuting and defending a hypothetical case, involving a defendant who allegedly sold drugs, during an all-day tournament held at Northeast College Preparatory High School at the Douglass Campus. Members of the media are invited to attend the final rounds and awards ceremony held 1-4 p.m April 13. Salmon and Carson, hosts of the “Esquire Hour” on 100.9 WXIR-LP, approached RIT GEAR UP as a co-sponsor for the mock trial tournament. The program is part of RIT’s K-12 University Center and has well-established connections with the Rochester City School District, students and parents and served as a liaison to make the 10-week event happen. 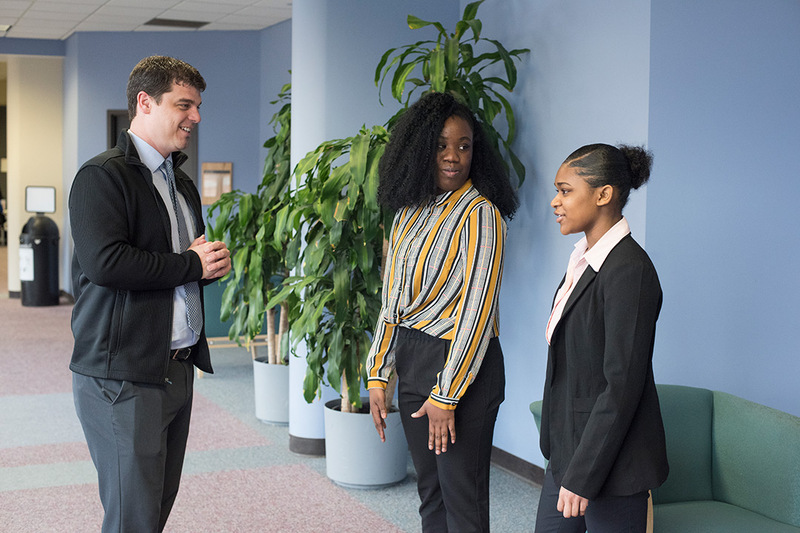 Farrell would like to see RIT GEAR UP cultivate more community partnerships like the Esquire Hour All-Star Mock Trial Challenge that connect students with professionals working in different fields. RIT GEAR UP works with city of Rochester’s class of 2020 high school students and their parents to build a path to graduation and careers. The future-readiness program is federally funded through the New York State Higher Education Services Corp. to increase the number of economically disadvantaged students who are prepared to enter and succeed in higher education.